Summary: The York Active 120 Treadmill is a popular mid-range model with some a large running space, advanced console and more than enough speed (with a 16km / hour top speed). This model folds away and has a 12% powered incline capability (more than many rivals, which typically stop at 10%). 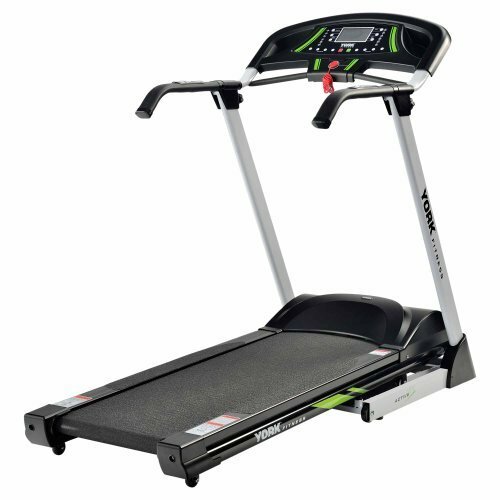 A treadmill from a popular manufacturer with many happy users (positive reviews). You can check the latest discount and read the comments from buyers for yourself over on this dedicated product page at amazon.co.uk. This treadmill is robust, and looks great too. There’s 13 programs to work out (or you can control manually if you prefer), the pulse sensor on the handlebar is a neat little feature I like too. The incline makes for a challenging uphill run so you can really feel the difference! I’m recommending this as a top choice in the mid-range price bracket. Check out the gallery, big (at the time of writing) discount and buyer feedback for yourself now on the amazon.co.uk dedicated product page.